When owners Joey Ryan, Josh Walker and Duolan Li leased the building, the team agreed that the collective aesthetic was to celebrate the ‘imperfect beauty’ of the former gas station rather than develop a rigid vision. This aesthetic decision meshes with their food approach – serving dishes from various backgrounds rather than pursue a single, formal line of flavor. Working with the space as it was, the design team explored a few basic concepts as the renovation progressed, and worked new findings and field conditions into the restaurant as they went along. The result is a very comfortable space which feels contextually right. Just one year before opening, Josh, Joey and D were looking around the city at spaces to lease. When they found this space, they were pretty sure immediately that it was the right fit. After 5 months of working through the lease process, they signed. 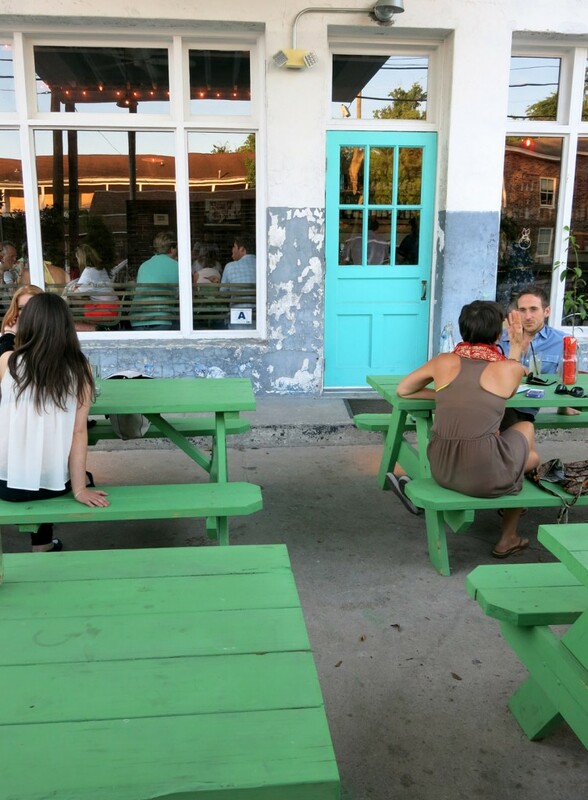 At the time, a series of pop-up dinners had left the owners sure of the food – Josh noted that they “had been playing around with the menu for 6 months.” Now, the focus was on the upfit. The new Xiao Bao Biscuit has something that many sites locally don’t have – a modern façade. 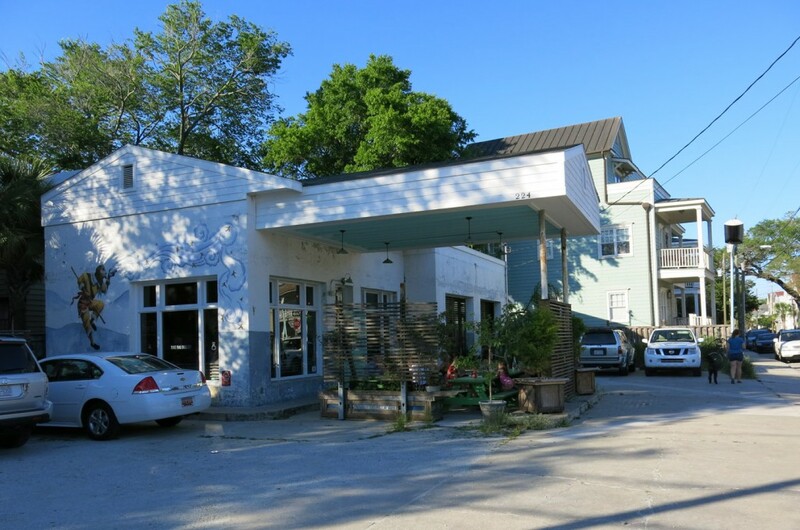 Sited in a former car repair shop and gas station, owner Joey Ryan reports that this building is part of what was known in the 1960’s as Gas Station Alley – a stretch of Spring Street where people driving through Charleston would stop and fill up. Indeed, there are other service center renovations nearby including Mission Yoga (more on that in a future dispatch). The floral shop Tiger Lily Florist once housed a gas station where Josh’s grandfather worked. The owners brought design ideas to bear on the project. Firstly, they wanted to celebrate the building as it was. Joey said they “…loved the outside – loved the way the building looked. There was no place in Charleston that was using the outside like this.” Relying on the building’s existing character was smart for their budget. Josh said, “When we saw this place, we thought it had so much character – the brick on the walls we didn’t need to do anything to.” The entrance has four electric-green tables surrounded by two site-built planters under the old drive-through canopy. Bright green tables, and bright turquoise doors – it’s a great combination. Photo by Sarah Corbitt. Opening the space up meant demolishing interior walls and installing a new beam for reinforcement between the bar and east side seating (which was formerly the gas bay). The space now housing Xiao Bao Biscuit’s larger, family table was the former gas station bathroom. A 7’ building addition at the northeast of the site was built in the 1980’s; it now serves as storage. The window closest to the front door was cinderblocked in, and an air old conditioner was walled over – all of that infill was demolished. Joey said that airiness became the focal point. 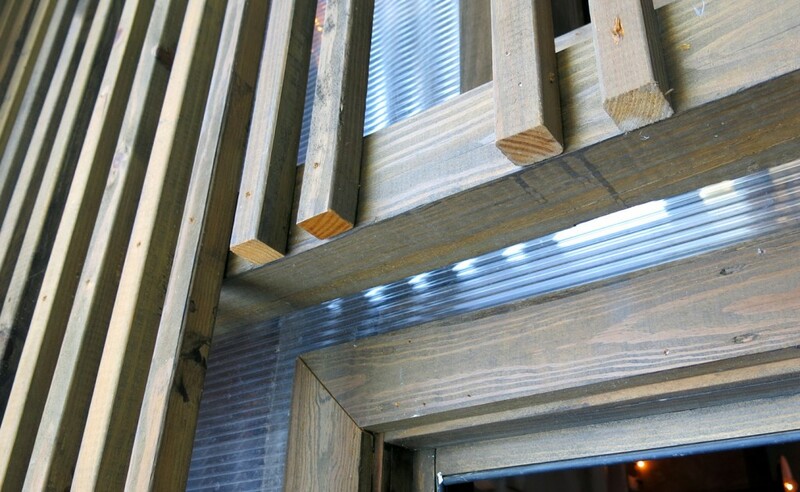 The owners created large expanses of windows with one layer of polycarbonate material and wood. Shelves built just inside the windows provide nooks for green plants. So far, the site-built polycarbonate windows don’t get too cold in the winter, maybe because the restaurant generates its own ample heat. The owners’ thermal range reflects the desire to be more open to the outdoors – the thermostat in May was set to a pleasing 77 degrees (heavenly for me! ), and I’ve been many times when both exterior doors were flung open to warm summer breezes. The bar came together out of a few different materials. Photo by Sarah Corbitt. Josh noted, “We just wanted to be careful with design, there are so many kind of clichéd things that can be done.” Even though Xiao Bao Biscuit celebrates Asian cooking, it has the look of a place sifted out of lots of influences over time. The owners have traveled in Central America, South America and in Vietnam and Thailand. 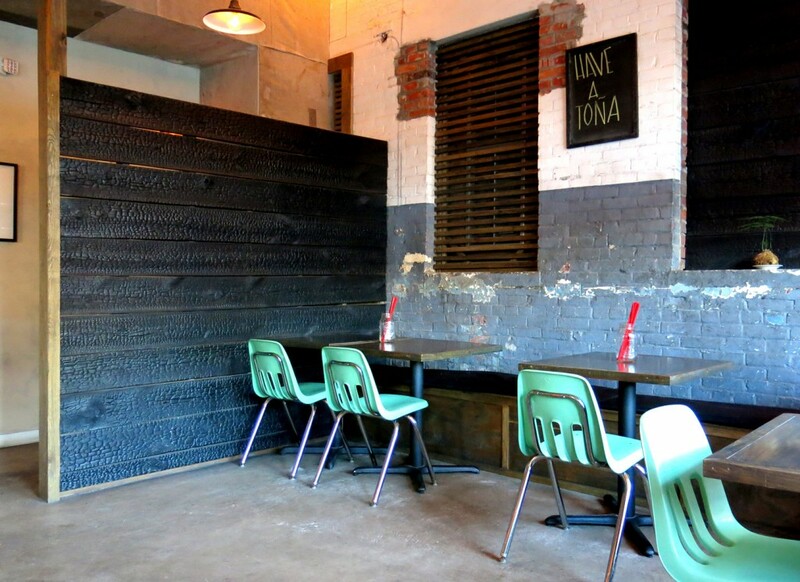 A charred wall was an idea Josh and Duolan had when they saw a similar one in Japan, and Joey and Josh worked with local woodworker Michael Moran to char local pine boards for the accent wall, possibly for the front of the bar. After four and a half minutes of burning, the boards were burned deeply black, with a now fireproof and waterproof wood grain. For restaurant use, the boards were sealed with polyurethane. Ultimately, the accent wall was moved to divide the bathroom area from the dining room, within touching distance of a few of the tables on that side. As for the variety of interior paint colors and finishes, the owners note that no surfaces are uniform, so just one solid color just wouldn’t work. Walls are clay-red and cement gray with dark wood, and chairs are bright turquoise. The floor is sealed concrete. There was a split level floor with a lower floor where the car repair area used to be. To fill this in, the team added 2’ or 3’ of concrete to create a level space. Over the years, the building had been modified, including a pitched roof, probably dating from the 1980’s, which was installed on top of an existing flat roof. There was a sheetrock wall where the bar now is, separating the waiting area from the car repair office. The design team included some key, collaborative players, in addition to the owners and Michael Moran. 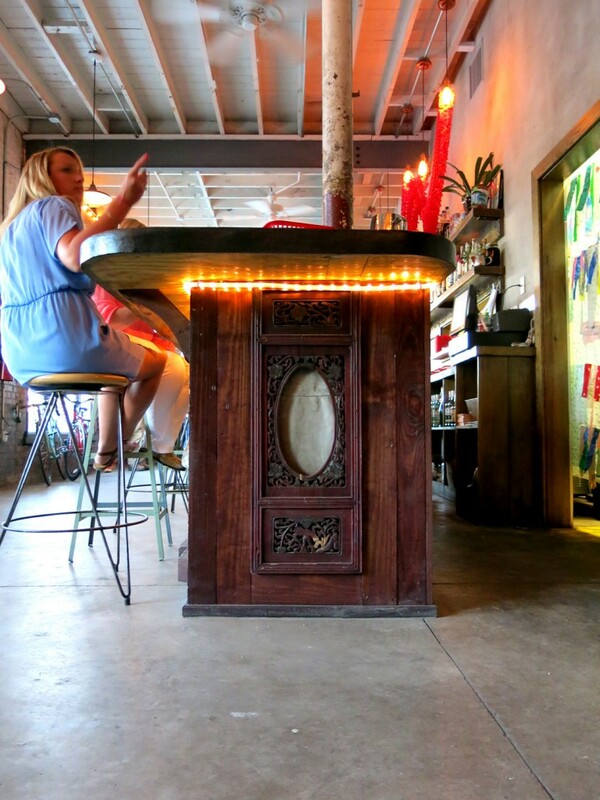 Susan Allen helped with finished and surfaces, notably the cement-like finish on the wall behind the bar. Brett Elrod was the contractor, and his experience working in Charleston eased the permitting process. . Josh and Joey credit Brett Elrod with keeping the project moving, “They started swinging hammers for us on August 1 and then we opened November 1.” Some initial concept work was done with Whitney Powers and her staff at Studio A Architecture, including Patrick Head. Xiao Bao Biscuit’s marketing aesthetic favors subtlety. There are no large signs on the building, just small lettering on the windows. The website features close-up images of food and drink, and reservations are not taken. Big design challenges, and costs, were adding water and sewer to the site, and a grease trap. There were no accurate site plans – that added to the cost and time it took to get services in place. Josh said, “It was basically like we were prospecting for oil” to look for water, gas and other services, “the entire parking lot was dug out.” A mere three weeks before opening, the side parking lot was completely dug up to install the grease trap. Josh observed, “Nobody believed we were going to open.” There were also no accurate plans of the building itself, so it had to be measured. The building’s design went under review for staff approval, and not the intensive full review. The owners have a good relationship with the building owner, and they may ultimately buy the building. Joey hopes to add an old, fuzzy TV someday to the outdoor area, where diners can watch soccer or political events.